Rome, Arata and Baxley is proud to defend the rights of El Paso area railroad workers. We have successfully handled railroad injury cases in El Paso county against Union Pacific, BNSF and Amtrak. The railroads that service the El Paso area recognize our name and know that it means that the injured worker is represented by one of the best FELA attorneys in Texas and the entire United States. We are extremely proud of the results we have achieved for our El Paso area FELA clients. Please feel free to ask us for a referral and we will put you in contact with one or several of our satisfied FELA clients from El Paso or the surrounding areas. El Paso's population and jury pool is a reflection of its location and its economy. 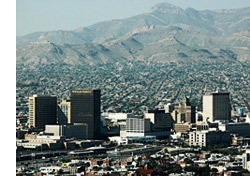 Like other cities in the Southwest United States, El Paso is predominantly Hispanic, and its population comprises many recent immigrants, especially from Mexico. El Paso is an important entry point to the U.S. from Mexico. Because of this, the U.S. federal government has a strong presence in El Paso to manage its unique issues as a border region. The military is another major contributor to El Paso's economy and as of 2011 Fort Bliss was the largest employer in El Paso. Education, is another driving force in El Paso's economy. It is home to the University of Texas at El Paso and El Paso's three large school districts are also top employers in the region. More than 70 Fortune 500 companies have offices in El Paso, including The Hoover Company, Eureka, Boeing and Delphi. Due to El Paso's large bi-lingual population it plays hosts to numerous call centers such as EchoStar, MCI/GC Services and West Telemarketing. El Paso has been an important part of transcontinental railroad transportation since December 15th, 1881. On that day, the Southern Pacific and Texas & Pacific railroads connected in nearby Sierra Blanca, Texas completing the second transcontinental railroad in the United States. Amtrak, the national passenger railroad, serves El Paso at the historic Union Depot, located at 700 West San Francisco Avenue, El Paso, TX 79901. El Paso is served by the Sunset Limited three times a week in each direction between Los Angeles and New Orleans. Burlington Northern and Santa Fe Railroad is the corporate heir to the Atchison Topeka and Santa Fe Railroad which was operating in El Paso before 1900. Union Pacific Railroad is the corporate heir to the Southern Pacific and Missouri Pacific railroad systems among others. As such, they have been operating railroads in El Paso since before the turn of the last century.